Bring a medium size pot with a couple of quarts of water to a boil. Add the barley, bay leaf, onion and salt, and cook to tender, 25 minutes. Drain and reserve with a tiny drizzle of oil mixed in to keep it from sticking. Place the chicken in a pot with the poaching ingredients and enough water to just cover the chicken. Bring to a low, rolling boil, season water with salt and reduce the heat. Poach for 45-60 minutes, turning once; cool in the poaching liquid to room temperature. Remove the chicken from the skin and bones, and dice or pull into bite-sized pieces. Strain the stock. Use half of the meat for the soup and reserve half for another meal or to add to a salad. You’ll have extra stock to refrigerate or freeze as well. In a medium size soup pot, heat the oil, four turns of the pan, over medium to medium-high heat. Add the mushrooms and brown. Add the celery, garlic, shallots or onion, thyme, salt and pepper and cook to soften. Add the sherry or Marsala to deglaze and reduce by half. Stir in 2 quarts of the chicken poaching liquid and 2 1/2-3 cups of the diced chicken. Wilt in the greens. Just before serving, combine the barley with the soup and heat through. In Recipes-list.com we have selected the most viewed recipes from category - uncategorized . Enjoy the best recipes specially selected for you! 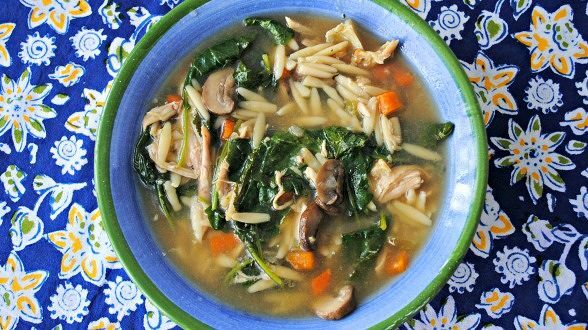 Chicken and Pearled Barley (Orzo) Soup is the right choice that will satisfy all your claims.